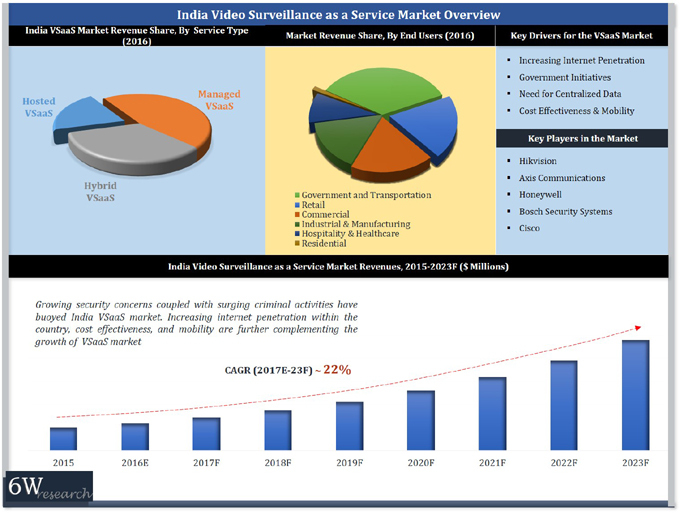 Rising security concerns, need for intelligent security system along with increasing consumer awareness towards surveillance as a service (VSaaS) have fuelled the demand for Video Surveillance as a Service (VSaaS) market in India. Traditionally controlled by hardware based surveillance systems, the country is now shifting towards surveillance as a service. Growing demand for VSaaS can be attributed to its cost effectiveness and maintenance which is done at the service providers' end. VSaaS in India is registering substantial growth in various vertical markets primarily across the government & transportation, retail and commercial. According to 6Wresearch, India VSaaS market size is projected to grow at a CAGR of over 22% from 2017 to 2023. Although, managed VSaaS segment accounted for majority of the market revenues; however, the facility of both onsite and offsite video storage are likely to proliferate hybrid VSaaS segment over the coming years. In 2016, the government & transportation vertical accounted for highest India VSaaS Market share in terms of market revenues, however, other verticals such as retail, banking & finance and education are considered as key growth verticals. The India VSaaS Market report thoroughly covers VSaaS market by types, verticals and regions. The India VSaaS Market outlook report provides an unbiased and detailed analysis of the India VSaaS Market trends, opportunities/ high growth areas, market drivers which would help the stakeholders to decide and align their market strategies according to the current and future market dynamics. 11.2	Bosch Security Systems, Inc.
11.4	Hangzhou Hikvision Digital Technology Co. Ltd.
11.5	Cisco Systems (India) Pvt. Ltd.
11.6	Infinova (India) Pvt. Ltd.